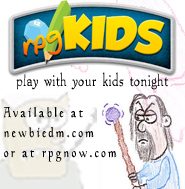 EDIT 9/2010: The new version of rpgKids is available here. If you are anything like me, your little kids are curious about D&D. I know that when game time comes at my house, my 4 year old daughter loves hanging around the table seeing what we’re doing. She’s full of questions about the minis, maps, and books. It had gotten to the point that she’d been asking me to play with her, so I played fake D&D with the minis and tiles, but with no dice. After a few times of doing that, she wizened up and asked me about the dice. I figured it was time, so I went ahead an invented a quick rpg for us to play together. I’m not making claims about being a designer or anything, this was a rough system I quickly put together in order to give her a minimalist rpg experience. Keep in mind, it is very, very simple. In play testing it I found that it would work better with a kid who knows how to add and subtract, although it is certainly not a necessity for them to enjoy it. My daughter also had a bit of a problem keeping track of the initiative, and whose turn it was, and I found myself having to constantly remind her. She did enjoy the dice rolling, and comparing the dice to see who rolled higher. She also got a kick out of seeing my bad guys miss when they attacked her. Our adventure had to do with her band of heroes (Emma, Cesar, and Noah; kids in her class) going after a treasure chest in a dungeon. They quickly met some opposition in the form of a few demon bad guys. She loved it. So if you have a 4 or 5 year old who is dying to play with your minis and tiles, give it a shot, it may be the solution you’ve been waiting for. I’d love to read about your thoughts and experiences once you give it a run. I must ask, why did you not play the real game with her? I mean with concessions that a lot of math is complicated, a first level game of D&D (Any edition) is easy in the grasp of a child. My sister started to play at about age 5, under OD&D, and the youngest child in my game started 3.0 at about the same age. While I do find your system quaint and quick, I am not sure that presenting them a dumbed down game is doing the child that many favors. Having D&D books available at early age tend to help with a lot of basic skills, if they explore the books. Your three R’s are all there, and can give a kid much better encouragement then they might find at skill. I’m not saying that what you did was bad, mind you. It’s a clever idea, and I salute the effort you went through to include your young one into your hobby. I just think that if they have an interest, you can help guide them to the point where they can play. Well, my kid isn’t going to grasp at-wills, encounters, daily powers. She’s not going to get the concept of trained skills or untrained skills, or understand what feats do. She wouldn’t understand the concept of races or classes. She can’t read yet, or do basic math. She’s only 4. She can’t even really count to 20 yet, not well. 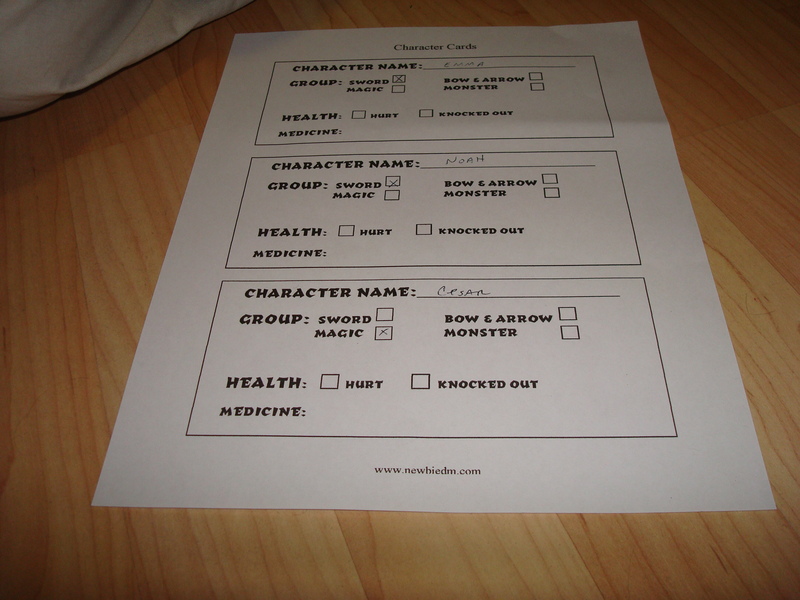 I think this basic system probably works better for *my* kid… not real D&D… not yet. lovely 🙂 I plan to adapt this and use it in some lessons I will be teaching at school! I think the system is good as it is, adding in skills may just complicate the matter further. Keep it simple and keep it fun. If they think they should be able to make something, or run/jump let them. It’s imaginative play don’t bog it down with rules. Nice job. I teach kids how to roleplay as part of an after-school club, and also have been roleplaying with my 7 year old son for the past couple years. With my son and younger kids, I tend to stick to games like PDQ and FATE because of the simplicity of the mechanics and the fact that using the dice (either 2d6 using dice with pips – we work on counting & later addition with those; or with FUDGE dice which lets you introduce the concepts of addition/subtraction and +,0, & – numbers). The key, IMO, at all ages is to focus on the storytelling and creative aspects of RPGs, not on the “kill monsters and take their stuff part to get experience” kind of play that many systems actively encourage which tends to start them off on the wrong foot – the real world is materialistic enough without having to focus a five-year-olds imaginary world on it as well. Great initiative man, thanks for sharing this. IMHO, my 4 year old son and his friends are better roleplayers than I will ever be (at least since I was 4 as well). I don’t think he would get the type of roleplaying that is found in the rules to D&D or any other game. He of course loves when daddy has game night, partially because some other kids come over to play, and partially because all the neat stuff is out. I look forward to him trying these out as we have been working on his addition skills and he is getting pretty good (he would be great if he had better motor control of his fingers:)). To me this is not about teaching him to play D&D, this is about a game that can be played with some of the D&D blig I already have. The structures roleplaying comes (much) later. Cool! I’m definitely storing this for later use, as my sons are too young at this point (older is 2 years and younger 2 months). I guess that’s the point. When you play it, come back here and tell us how it went, I can’t wait to hear how other kids did. This is really neat. I have been doing something the same but different with my 4 yr old for about 6 months. Your game has more of the RPG and I intend on adding that and I will let you know how it goes. One thing that my son loves is to use the d12 hit location dice. I made a little ‘code sheet’ that he uses to match the words on the die to pictures. Now he does not need my help and proudly knocks over my mini when he hits ‘full body’. Thanks for sharing your ideas! She rolls initiative once for the entire group. Once it’s her turn, she can determine who in her group acts in any order. This allows her to create a strategy as to who should act first. Same goes for your monsters. Once it’s the DM’s turn, the monsters can act in any order. Sam rules apply for the DM, but each kid rolls his or her own initiative. In case of a tie re-roll. This is a wonderful little thing, and a great thought exercise for those of us who don’t have kids yet. I’m thinking that I would have much the same thing, but have a plan for extending it as the kids get older. For example, perhaps add a single box called Skills that represents everything that isn’t fighting oriented. Then, as time goes by, break those skills out slowly. This is really good, but I have a question- you say ‘apply any modifiers’- where do they come from, are they situational ‘DM’s Best Friends’ or do you have another plan in place? @red artificer: No… the -1 for being hurt, or the +2 “friend bonus” for ganging up on an enemy. Those are the only modifiers in the game. That is until I release the “expert set”…… just kidding. I play with my siblings a lot, and even with full fledged D&D or d20Modern, Initiative was pants for a long time. It was really hard to have everyone keep track of it. I started folding note cards in half with a picture of the monsters on one side, and their stats on the other. I let my siblings draw their own players’ pictures. Then I could just put them in order on the the table and rotate them as turns went by. Super fun, super easy, and kids love drawing. This is awesome! We have a 9 year old girl who is all about Harry Potter and I’ve been looking for a simplified D&D for her to play and here it is! I am very much looking forward to using this as a teaching tool. For example, I’m going to let her create her own magic spells by giving a command in French. She will be able to write down 2 spells, and use any other ones she can remember. That should help her learn languages. Aw. The link went kaboom. getting an error when trying to download. possible alternate links? Mediafire is down for maintenance. Until late Thursday the 7th or early Friday the 8th. Why not just attach the PDF to this blog post? If you can email me the pdf you downloaded earlier, I will. Very nice, I love simple fluid systems like this. I bet she gives you more role playing back than many people using far more complex systems. Kudos for sharing! Hmm, the link doesn’t seem to work. Can you please look into this? Oddly the pdf I got earlier today caused an error in the printer when I tried to print. The first two pages worked, but the character sheets didn’t. I’ve never seen anything like it, it actually printed an stack error message. I came back to get another copy and the link is broke. Curses! There seems to be an issue with the character cards… I will upload these separately later tonight, I promise…….. I too have a 4 yr old who has been interested in daddy’s gaming stuff for as long as she can chuck a d20 across the room. 🙂 I’ve been nagging my husband to come up with a campaign ‘lite’ for her since she’s really into roleplaying and pretend play but he’s been so busy with his regular 4e campaign he hasn’t had time. I am so excited to give this a try this weekend. I ran the idea by my daughter and she is stoked to try it as well. This system is so cute and appropriate for the 4-5 yr old age group. I’ll report back when we’ve given it a whirl. Thank you! Okay. I’ve uploaded the correct file. Everything should work now following the link at the bottom. My 4yo son and I just finished a double session based on your system here. He loved it and by the second game had his characters talking to each other. I think he can handle a little bit more complexity, what do you think the next step up might be? Hit points? Different attack styles? I did vary things by adding in minions that knock-out in one hit and tougher monsters that take 3 hits to a boss monster (the Big Bad Wolf) that took 5 hits. That kept game play going on longer and kept him moving around more. That is awesome! I’m so glad to hear that!! The next logical step, I think, is weapons and armor that grant +1, and +2’s to the defense and attack rolls. “Magic swords and magic shields” thatsort of thing, but obviously at a basic level. +1, +2 seems okay. Cursed swords can cause a -1 for example to the attack roll…. @Brandon: Cool! How about expanding into non-combat? Kids love exploring, and love make-believe, so you could get into larger multi-room dungeons with secrets and traps (introduce Sneaky Guy for sure!) And/or you could get into story-telling by adding more rules for character generation, and adding friendly or less-hostile NPCs to interact with. I’m not sure how much I want to emphasize classes with my child though, I mean, 95% of the RPG’s I’ve played over the years are not class base,d I personally find most class-based systems to restrictive, but ‘m not here to extol the virtues of one or the other. I’m just saying that by keeping it basic, it will let each parent/child/group determine what parts they want to emphasize, and what they want to play-down. kind of like F.U.D.G.E. in that respect. Have you considered making the ranged guys work at 10 squares and the magic guys work at 5 but they get to attack two baddies per turn? Otherwise they are functionally the same. It’s a little unbalanced but, hey, she’s 4! I played your system with my 5 year old on Sunday afternoon. He loved it! 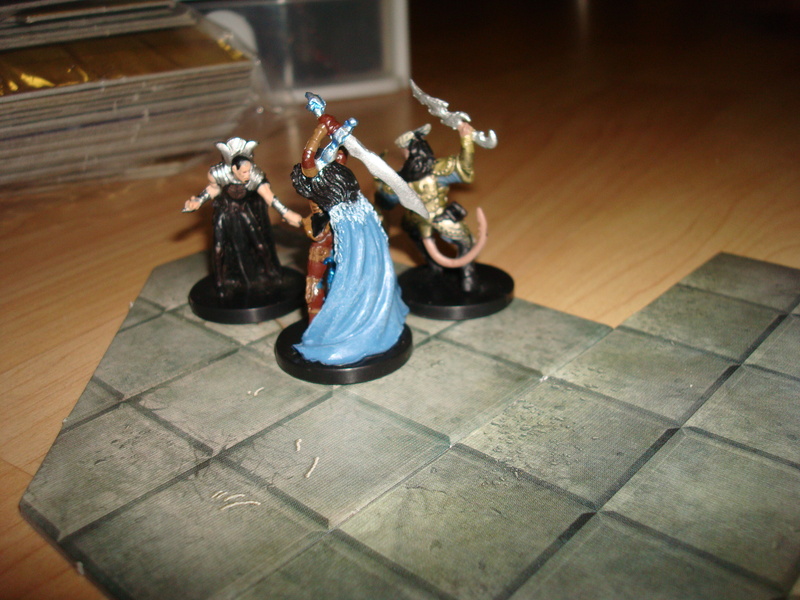 I printed out some dungeon tiles and got some bargain bin D&D minis at the local game shop. I also got him his own set of dice which he likes so much that he’s been sleeping with them in his hands. It took a bit to get him to settle down and not bash the minis together like they wer fighting, but once he got into it he didn’t want to stop. We even did a little adventuring after we had a few skirmishes and he got the rules down. He can’t wait to play again this weekend! Thanks so much for this! Not having played myself since he was born, I never would have considered getting him into D&D. I was also inspired to pick up a couple of other kid oriented RPGs: Faery’s Tale, and Meddling kids. Man, the response to this game has been fantastic. Between the comments here, and the emails I’m getting privately, I know that parents are having a blast playing (quasi)D&D with their kids. So cool. I’m glad. I look forward to trying this with my kids. Thanks. I discovered your blog (through WotC) yesterday and it had just so happened that I was going to be playing D&D with my son for the first time today. I took your RPGKids idea and tweaked it a little for my son (the idea of using modifiers is just a bit beyond him right now, he is not quite 4). It went over great! Thanks! I’ve played twice now with my 4 year old and she thought it was great and wants to do it again. She did have a few issues telling which dice rolled the higher number, so we are still working on it. Maybe this is just my daughter, but she likes playing monsters more than humans. I let her look through my minis and the first game she used an archer, a knight, and an Intellect Devourer. For our second game she wanted all new characters, so she chose a Crocodile, a giant toad, and a wolf. I’ve been role playing with my daughtera little bit. My oldest is also very interested in roleplaying, although I’m not a fantasy roleplayer and he’s not particularly interested in genre either. What he wants to play is superheroes. My plan is to use Savage Worlds since it has decent superhero rules, and have solo hero adventures where my boy can foil bank robbers and other minor thugs before encountering his super-powered nemesis. In the first instance I would basically operate the mechanics and let him focus on storytelling and roleplaying. And I would get him to roll the dice too, of course. He’s very excited about the prospect. Painting the superhero figures is an important part of it too, of course – we had a blast designing the costumes! Can you please re-post the rules? Thanks for the ideas, awsome system! I’m trying to build a sumpler DnD version for kids less than 9 years old. How did you incorporate attacks? How were monsters set up? Loved the simplicity of it all! Great job!!!! masterwork. you have done a magnificent task on this subject!